Summon: Transform the highest cost creature in your opponent's hand into a Shriveled Mummy. 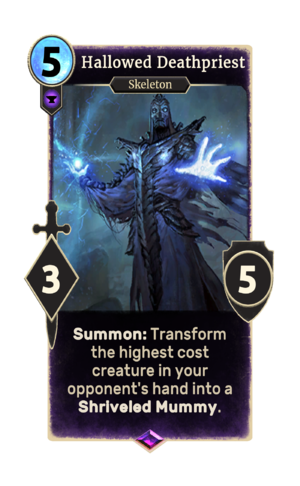 Hallowed Deathpriest is an epic Endurance creature card. It is part of the Clockwork City story set. A playset of the card is awarded for completing Forelhost Front Gate. The premium version can only be obtained by soul-summoning, which is only possible after the completion of Forelhost Front Gate.